Kling! 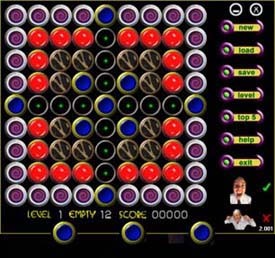 2.001 is an addictive logic game played on a 9x9 grid. The objective is to line up five or more balls of the same color, either horizontally, vertically , or diagonally. Each time a ball is moved, three more balls appear on the grid. You must actively clear off lines, or the grid will fill up before you know it! Kling! offers five levels, but each game starts on the first level and advances based on accumulated points. Games can be saved and reloaded. Kling! 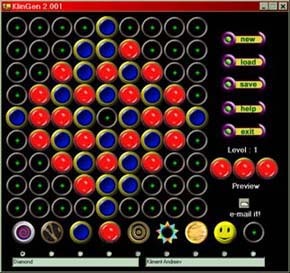 2.001 is a fun puzzle game for all ages. In the packet with Kling! 2.001, there is a program called KlinGen. Use this program to create your own levels. Your creations will be published here.